Woman found near market on Yisrael Zangwill Street in Netanya. MDA team treats woman and evacuates her under sedation to Beilinson Hospital. 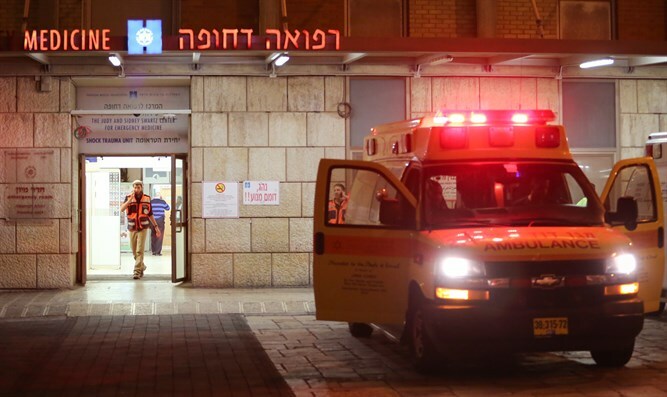 A 30-year-old woman was found last evening bruised in the head, bleeding, and unconscious near the market on Yisrael Zangwill Street in Netanya. A MDA team treated the woman and evacuated her to the Beilinson Hospital in Petach Tikva, where she was listed in critical condition. MDA medic Eliran Avital said, "When I got to the street I saw a woman of about 30 lying near the entrance to an underground parking lot, unconscious and suffering from a severe and bleeding head injury. "I gave her initial medical treatment that included stopping bleeding, and together with the intensive care mobile team we gave her advanced medical care including anesthesia and respiration, and she was evacuated in serious but stable condition to Beilinson Hospital," he added. The hospital said, "A woman from Netanya was evacuated to the trauma room of Beilinson Hospital with signs of violence. The woman is in critical condition with a head injury, is sedated and on respiration. She's on her way into surgery."